Designation of dynamical loads on robot construction and drives. If robot is resting then there is no dynamical load on it. Robot’s construction and arm have only statical load which depends from mass of robot’s part elements. If robot starts to move its main controller controls its drives and sets programmed accelerations and velocities. From that moment on robot’s construction also dynamical forces are torques are working. Constructor has to calculate what forces or torques could appear because he has to know what kind of drives to choose. constructor has to know how control drives during motion. 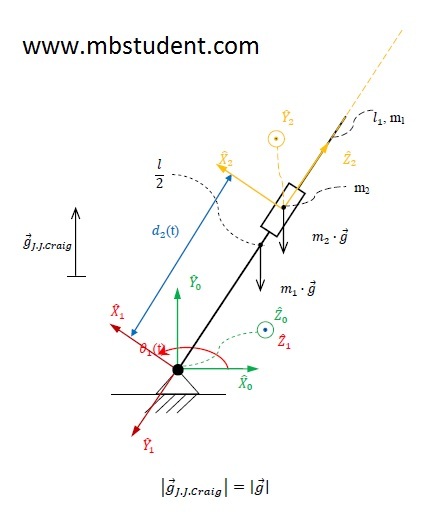 On this website is placed full project with analysis of robot dynamics during motion. Robot which is considered here has quite simple construction because it consists only two elements but even for two element robot dynamical analysis is quite difficult. During robot’s motion various kinds of torques and forces works on robot. Some components of load is worn by robot’s construction. Rest of loads have to be equivalent by robot’s drives. If we construct a robot we have to know values of forces and torques because that knowledge is a base information for servodrives control.